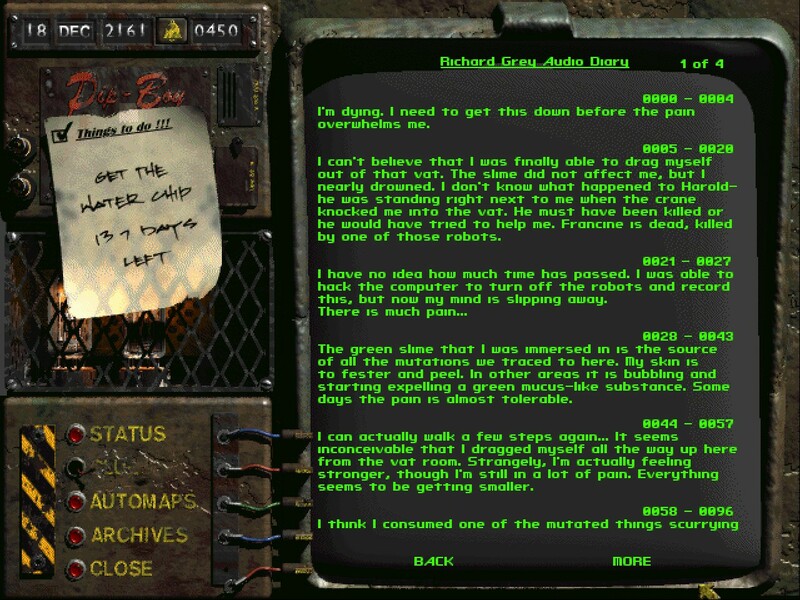 A couple of logs I missed in the Military Base that fill in some backstory (most notably that of Richard Grey/The Master). 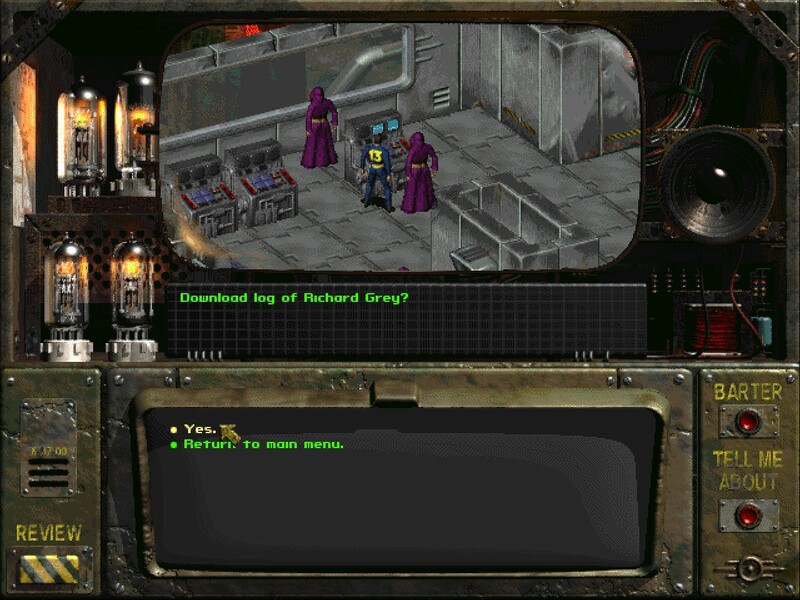 You can download these from the computer in front of the Vats on the fourth floor. Two talking head characters I neglected, both associated with the Followers of the Apocalypse: Nicole and Laura. Nicole is the other girl just north of Katja, Laura's acting as a spy in the Cathedral. If you agree to help Nicole, she'll have three of her followers assist you in combat in the Cathedral (unlike the Brotherhood allies, they will actually follow you into the depths of the base. However, they're armed with spears, sledgehammers and throwing knives, so they're not too helpful...). They both provide a little more backstory on their respective areas, but you don't gain any experience for helping them. Do a "pacifist" run. That means you don't witness a single death or cause one yourself. Kill Aradesh, Tandi, or both. All three have different endings. Enter Shady Sands after 230 days have passed. It will be overrun by Mutants. This also nets an alternate ending for Shady Sands. Don't enter the Raiders camp at all. This gets an alternate ending for the Raiders. Befriend the Raiders, kill less than thirteen raiders in the camp, or leave Garl alive and kill less than eight raiders. This gets an alternate ending for the Raiders too. Convince the Raiders that you're Garl's father (requires 9 Luck and a successful roll, determined when you enter the camp for the first time). This can be used to free Tandi without a fight. Take the chip, but don't bother fixing the water pump. This gives an alternate ending for Necropolis. Enter Necropolis after 120 days have passed. It will be overrun by Mutants. Another alternate ending for Necropolis. Carry out the hit for Gizmo. An alternate ending for Junktown. Carry out the hits for Decker. Kill the Blades for Zimmerman. Agree to join the Unity (reveal Vault 13's location to the Lieutenant or the Master). This gives a (very violent) "bad" ending. Take a stealthy approach to the Military Base. Talk your way past the mutants (easier with the robes), repair the bot to get into the room, then discreetly arm the base and escape before anyone knows what's happening. Take a stealthy approach to the Cathedral. Use the robes to sneak in, the Lou's key to arm the hidden bomb, then escape. Try killing the Master in combat. It's pretty tough! A crashed alien saucer containing a velvet Elvis painting and the Alien Blaster, the single strongest weapon in the game. "Bob's Pre-owned Car Mart", with a salesman surrounding many broken down vehicles. His shack contains the Red Ryder LE BB Gun, a rifle that always does a flat 25 damage. A herd of talking Brahmin that repeatedly say "Moo!" and "Moo, I say." 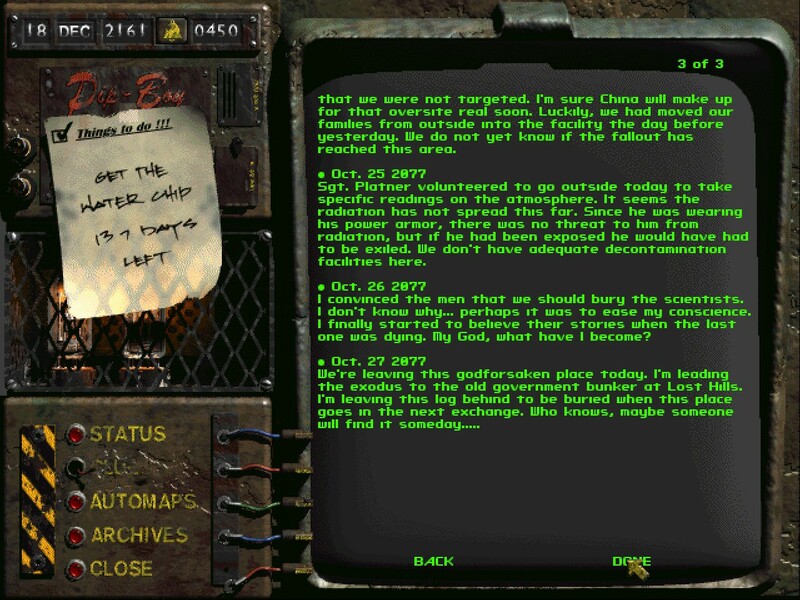 A reference to a prank Tim Cain would play in the MUD "Darker Realms". A giant footprint with a crushed peasant in the center. The peasant has a Stealth Boy. 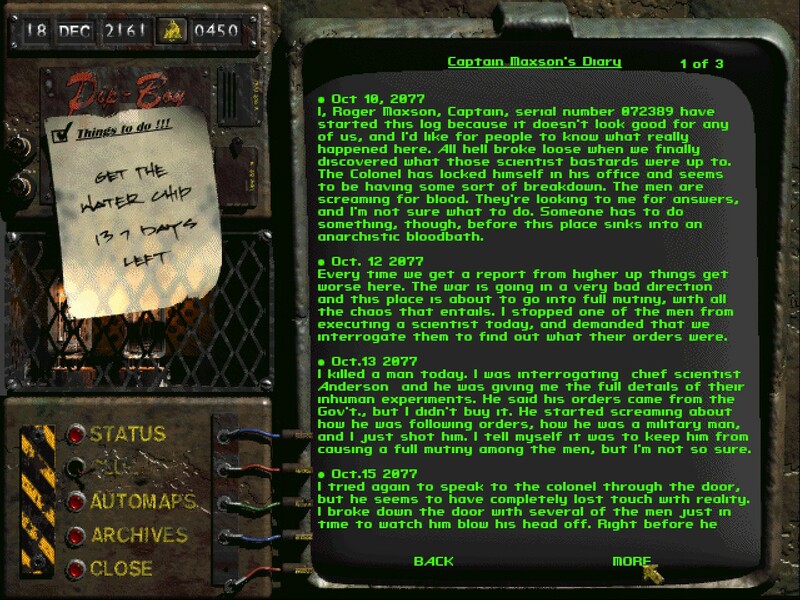 A reference to the original script of Fallout, which contained time travel and dinosaurs. A crashed Nuka-Cola truck which has about 3000-6000 caps in a crate, depending on the player's Luck stat. The amount is doubled if they have the Fortune Finder perk. A police call box that disappears as you approach, leaving behind a Motion Sensor. Reference to Dr. Who. Some endings do not show up in the game due to incomplete coding or cut content. There is a good ending for the Boneyard where the Followers of the Apocalypse gain control of the Boneyard and become a political force in New California. Presumably you would have to complete the "find the Cathedral spy" quest to see this (which isn't possible since the spy in question was never programmed in...). 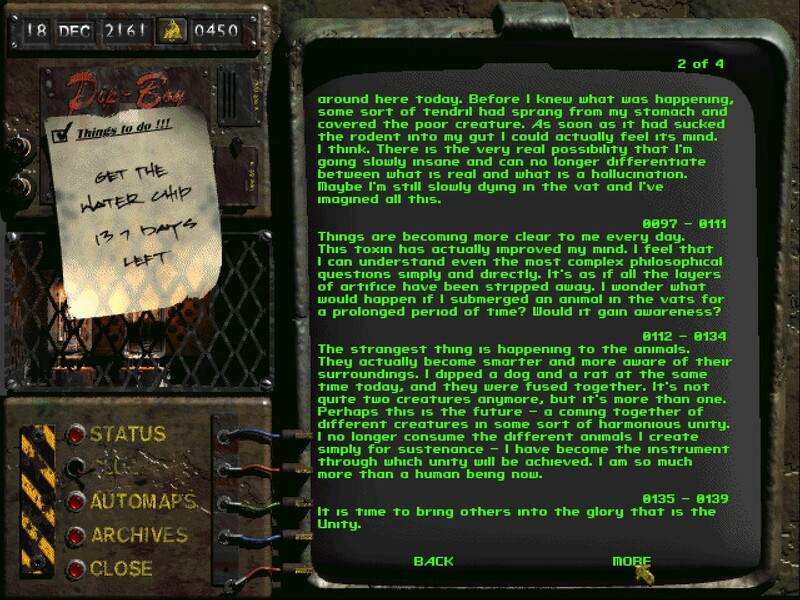 Ironically, later games establish this as the canon ending for the faction. Junktown has an unused ending where it is razed by mutants; however, Junktown will not be overrun by mutants in game. Presumably this should have occurred if too much time had passed before the end of the game, as is the case with Shady Sands and Necropolis. This may also have been intended as the ending if both Killian and Gizmo were killed (or possibly neither), but does not play in those situations. The original "pro-Killian" ending for Junktown had Killian turning Junktown into a police state, and the "pro-Gizmo" ending had him turning Junktown into a safe and prosperous resort. These were changed when the marketing department decided that the game had to "reward good and punish bad". There is a good ending for the Hub where Harold and the ghoul population bring prosperity to the Hub alongside humans. The means to achieve this end were never implemented.